I think it’s a perfectly reasonable change, except for that the last variable might specify the selection length instead. At least that’s the data available to me from PsPad. I would assume it is available through Crimson Editor, SciTE and other popular editors (it’s for sure available in monsters like vim or emacs). character from the editor to even the simplest batch script. The command line interpreter cuts the argument stream as soon as it encounters that character. So yep, passing 2 optional numbers that specify start and end (or length) of the selection sounds like the simple and effective way to solve the problem. In wost case (for an editor that does not provide this info) I think that this problem could be solved using some scripting for the specific editor. For isntance by writing a script that would read the selection, write it to the file and call mapy with that file as an argument, then delete the file (optionally). Do you think it would be possible to provide the index of the starting character in the file and an end index respectively and not just first and last line? That is to truly support the “execute selected code” feature. Ok guys, Mapy v1.1.6 is out. Some bugs fixed and there are more cleaner maya output. mapy  "path to your file"
mapy "start line" "end line" "path to your file"
Now with a cleaner command line output and catching all the output it’s a very useful tool. I couldn’t find a variable corresponding to the “endLine” of selection in PSPad so I wrote a java script that invokes mapy on selected text for PSPad. Let me know if anybody needs it. I will be using mapy from now, thanks for the great contribution! Some of the bugs that you mentioned have been fixed now. Check it out. print ("Counter is now: " + $i + "
And this code works perfectly well when copied to Maya. Sorry a little mistake in code. This problem is solved now and mapy 1.1.8 is ready to download. Henry: please give me a quick response if your problem is solved. You do a great job for me last few days and I will mention your efforts in my site. That error seems to be fixed now. And everything seems to be working great (except those small issues that could well stay unfixed). Only thing now is that it takes a long time to send big scripts to Maya. It literally hangs for seconds before the output returns. I am pretty sure it is due the printout of the sent text on top of mapy’s output (new in 1.1.8). I’ve compared it with mapy 1.1.6 and it was just fine. I would vote to remove that output on top because when you send a big script you end up having a mess there that would not be very helpful (and slow the send process). When sending parts of the file the user sees his selection in the editor anyways. Please chack my site every day because I will release 2 versions each day! But don’t warry. 1.2.1 will the final version:applause:(At least in January). I’ll put them on my website. Thanks for the quick fix. Looking forward to the next versions, I think there should be a better solution instead of a “sleep” one. 1.2.0 is great Really nothing to complain about, the sending process seems to be much faster and works fine with big scripts now. No glitches so far. Thanks henry for your quick test but I should confess that there are little bugs that remain in mapy 1.2.0. I will try to fix them in 1.2.1, but please test and test and test until find a problem and send it to me. Indeed, there is no bug, until someone finds it:rolleyes:. Well, finally I completed this release. :bounce:Major changes have been made. the best part is when you select any part of your script in any script editor, only that part will be executed. This process is completly automatic. Just like maya’s native script editor. So all of command line options have been removed. I hope afetr fixing little bugs (That you will inform me), I can release mapy 1.3 That will be first stable version. I’m waiting for your fast and detail reviews. and send me the results. (I know mapy is it’s first steps). Since mapy is free tool, I really need the feedback from all users. 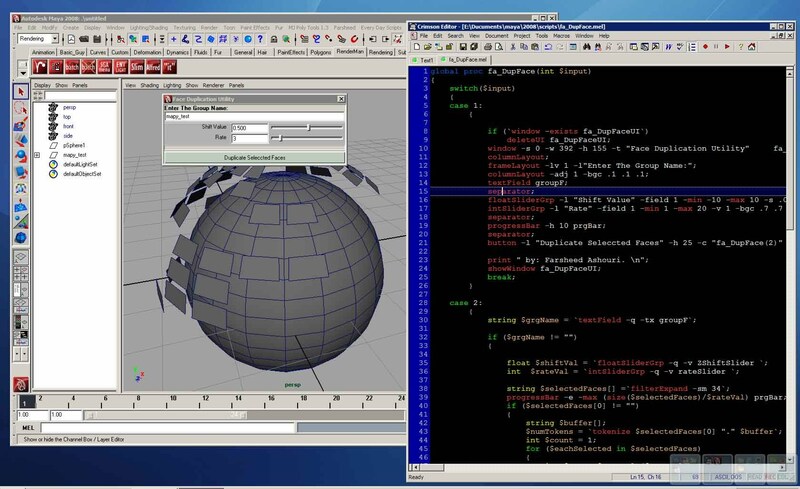 [li]You should add mapy installation path to your path environment variable. [/li][/ul]HaVE FNn. 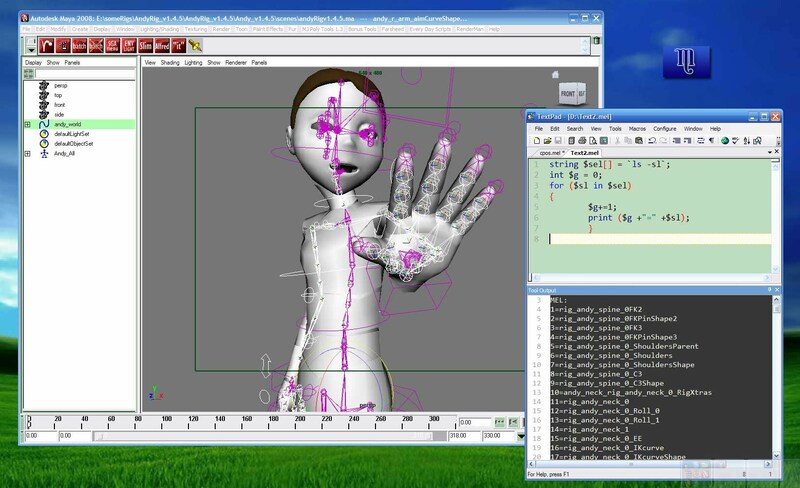 Also it seems like it’s taking more time to send Mel to Maya in 1.2.1 now, about 1 second lag. I don’t remember this being the case with 1.2.0. Can this be due to the “automatic” selection check in the opened editor? Well guys, version 1.3.0 of mapy with faster speed and better code sending is out. All known bugs are fixed in this version. Download Latest version of mapy here. Tried Mapy with SourceEdit, and just adopted the instructions from Crimson and it works fine (after the command line add " $(FullName)" without the quotes). Works for executing the file anyway after save. Yay! Since Digimation doesn’t have a MelStudio LE for 8.5+, I had to find some way to be able to deal with scripts, and Source Edit is my other favorite IDE (it’s free and you can have a lot of scripts open in it).